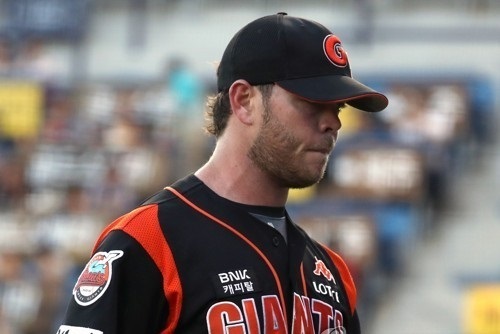 South Korean baseball club Lotte Giants on Wednesday released struggling American pitcher Nick Additon. The 29-year-old left-hander went just 2-7 with a 5.91 ERA in 15 appearances for the Korea Baseball Organization club this year. He joined the Giants on March 29, two days prior to the start of the season, as a last-minute replacement for Parker Markel, who asked to be released after struggling to adjust to the new league in spring training. Additon came to South Korea with a career minor league record of 65-63 and a 3.77 ERA in 245 appearances across 10 seasons. In the KBO, Additon once lost five straight decisions and made two appearances out of the bullpen last month following a brief stint in the minors. He pitched better in his last three starts, holding opponents to four earned runs in 16 1/3 innings, but the Giants still decided to part ways with him. The Giants, currently in seventh place among 10 clubs at 40-43-1 (wins-losses-ties), said they'll sign Additon's replacement as soon as possible. KBO teams are each permitted to carry three foreign players, one of whom must be a position player.